The gadgets and services for Lifelogging and practitioners of the Quantified Self continues to grow and evolve at a very fast pace. I made a trip to CES this year which was unique in that it provided a situation for my personal and work lives to collide. 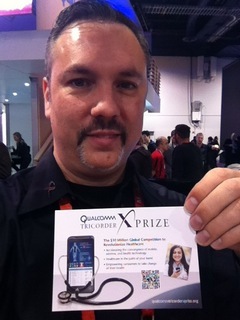 As manager of web production for the X PRIZE Foundation I was attending CES to help work our booth in support of our launch announcement for the Qualcomm Tricorder X PRIZE. On a personal level I also was very curious about all the new health and fitness gadgets and services that would be announced. Below is a video of Qualcomm CEO Dr. Paul Jacobs speaking at the CES keynote. If you forward to minute 58 you will see him bring Dr. Eric Topol onto the stage who then demonstrates several new health monitoring gadgets that are already available or coming soon. You can also see X PRIZE CEO Peter Diamandis announce and provide details about the Qualcomm Tricorder X PRIZE at the 1 hour, 8 minute mark. This years’ CES showcased many new technologies that will appeal to both the Lifeloggers and increasingly the mainstream public as well. Unfortunately I didn’t get to walk the show floor very much but I have been monitoring all of the news coverage that has been coming out since the show. The competition for health and fitness tracking devices is really heating up. Early devices like the Fitbit and Bodymedia Fit saw some new players enter the market with the recent Jawbone Up as well as the Motorola MotoACTV device announced at CES. Then just 3 days ago right after the dust was settling at CES Nike announced the Fuelband which is similar to the Jawbone Up in that it is a device you wear on your wrist. In fact Digital Trends went ahead and wrote a post to compare the two similar devices. Then Mashable stated that “Nike also announced partnerships with Foursquare and Path.” I find this information very interesting since Path had hinted at offering the ability to integrate with the Jawbone Up in the future and now the Nike Fuelband announcement pretty much solidifies that, but also shows that they’re considering support for multiple devices. The integration of Lifestreaming and personal tracking devices is very exciting and Path will be a first mover in this area distinguishing their app from anything currently out there. Even though I didn’t get to walk the show floor I was lucky to be working the Qualcomm booth next to Bodymedia’s Chris Knorr. I learned about updates to their service that will analyze the activity data to help provide recommendations and adjustments. They’re also releasing disposable patches in addition to the armband. I asked Chris what health related devices or services he had seen that were impressive at CES. The first thing he mentioned was the Macaw App which is aimed as a prevention plan based health app available for both iOS and Android. It’s supposed to provide the ability to be paired and synced with multiple wireless health devices and then import all the data in one place to provide a health profile. I downloaded the app but don’t yet see the ability to add 3rd party devices and didn’t find any details on their website about device support. Perhaps it was just announced and coming in the near future. On the surface it sounded somewhat like the health aggregation service I wrote about last May which I’m sure we’ll start to see several startups attacking very soon. The other device and service that Chris told me about was Striiv. This device and service puts an emphasis on gamificaton to motivate people towards staying fit. Striiv does this by providing a pedometer device that has a built in display that ties in your activity to generate resources which you can use in a simulation game called MyLand. The other nice aspect is that you can also donate your activity to help various causes via GlobalGiving. The LA Times review called it “Sim City meets Wii Fit” which seems like an appropriate comparison. If you visit the link you can see a video demo of the unit. Yesterday I read Dean Takahashi’s post stating that “Quantifying our lives will be a top trend in 2012”. It’s a great summary of some highlights of personal tracking devices at CES with his thoughts on the near future. I obviously couldn’t agree more with Dean and think these devices will continue to get better, cheaper, and continue to improve by analyzing the data to help improve our lives. This is going to be a great year for the health and fitness technology space and I’m really looking forward to it.